Good to see Blandford Forum's Badger maintain a redoubt in the Smoke and this isn't a bad stopping off point - the ales such as Thirsty Ferret and Hopping Hare may be quite common in supermarkets these days, less so outside Dorset's pubs. That said, it seems to have been refurbished a little too clinically as the pub bears little resemblance to a book on London's Best Pubs that had provoked our visit. Found this in a Camra Pub Guide - but there's not really too much to recommend it. I normally get on OK with Badger Beer - but the tanglefoot was headless, weak tasting and pretty insipid. Nothing to make this place worth revisting. One of my favorite pubs. This pub has changed a lot since 2007 when I first went there for a karaoke night. The place hasn't gone downhill at all, still cozy, clean, welcoming. However it seems to have virtually no entertainment at all anymore? No quiz nights, no darts or pool table, no karaoke, no comedy nights (they used to do that, too! ), NOTHING! All you can do there is drink and eat, which is fair enough, but BORING! I haven't been a regular for a while because I can't be bothered to travel from where I live just for a pint? I am not sure whether it's just landlord being lazy or people wanting food, drink and nothing else? Quite a nice place to frequent from time to time, and one of few places where I am happy to go to on my own. Was pleasantly surprised when I nipped in last night, the last time I was in here was a few years ago when it was a Sam Smiths place, yuk. Quite a tasteful refurb although the bar area remains the same. Tanglefoot, Badger, Fursty Ferret and Sussex (not the Harveys variety) were all on and well kept. Quite a selection of Europiss lagers as well, for the tourists I suppose. Clean, tidy and the staff were attentive without going overboard, I didn't have to wait long at all for service, unlike other pubs round here. 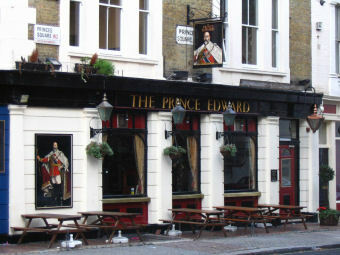 This place says that it is "The last real pub in Notting Hill" and it is easy to see why. I think it really is but there again there is absolutely NO competition locally! Well worth a 9/10 easily.